Original Content: Does Metafiction Work For Kids? I definitely get M.T. 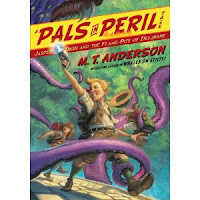 Anderson's Pals in Peril novels. They are takeoffs of old-time kids' series books, set in the present with a couple of characters who actually are the protaganists in their own adventure stories. Not the Pals in Period books, but other books. Imagine a Tom Swift-type character and a spunky girl (younger and spunkier than the 1930's era Nancy Drew) who are creatures of their own book worlds having over-the-top adventures in the twenty-first century. The newest book, Jasper Dash and the Flame-Pits of Delaware, isn't as good as The Clue of the Linoleum Lederhosen, but it has all kinds of clever things to offer. At least, it has all kinds of clever things to offer adult readers who will understand the satire regarding tourists looking for the ultimate experience and jokes about monks and prep school names. Though, truthfully, this adult wouldn't have understood the Choate joke if she didn't live in Connecticut and thus know what Choate Rosemary Hall is. As I was reading this story of a heroic boy ducking dinosaurs, cannibals, and tentacled monsters as he leads his chums across the jungles and mountains of Delaware to save a monastary full of monks from his archenemy, who appears to have come from outer space and has some kind of rocket launchers instead of feet, I kept wondering if child readers would get the jokes or be able to follow the story if they didn't. Do you have to have read a lot of many kinds of book to understand this riff on old time serials, sports novels, travel guides, and maybe a bit of lite Buddhist philosophy? Notice, I am not answering that question. I can imagine a boxed set of the Pals in Peril making great gifts for adults who were serious readers in their childhood. 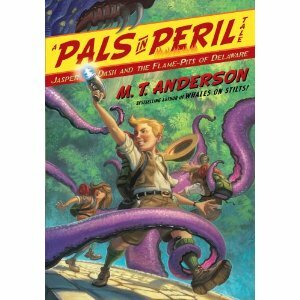 Hey, and what about the name of the series, Pals in Peril Tales? The series used to be called M.T. Anderson's Thrilling Tales. Why the switch? It looks as if there was a change in publisher from Harcourt to Simon and Schuster. Did the series' title not make the trip? I will pick up a book just because M.T. Anderson's name is on it, but did someone question whether children would? Plot Project: Perhaps we could say the plot here is developed around a journey, Jasper and his chums making the journey to save his old friend. A journey, yes, that would be a terrific structure for a plot. I should try to do one of those. So perhaps here we have a goal of creating a journey story and the objectives are all the near disasters the kids face on their journey. This is a great idea. Training Report: I learned this morning that I needed to do some unplanned, though not unexpected, eldercare today. Realizing that I had no hope of knocking off one thousand words on the Middle Ridge Road story and that trying to do so would only make me feel a miserable failure, I decided to prepare and make a submission that had been simmering on one of the burners. That way I could actually complete something, which would make me feel satisfied. Submissions are very satisfying, if you are able to stay in the moment and not spend any time thinking about the rejection that is almost certain to come at some point down the line. Instead, you just think of the submission as a good job done. Tah-dah! I also did a tiny bit of market research. Tah-dah, tah-dah!